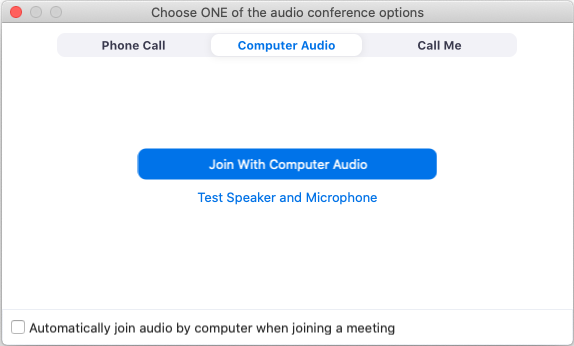 There are two ways to join meeting audio, joining via computer or joining via telephone. 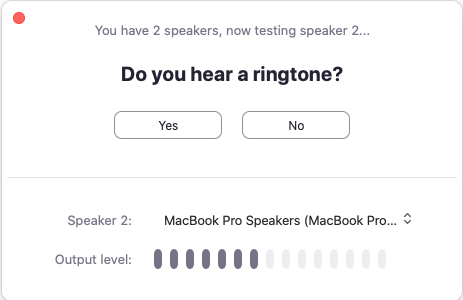 Follow these sections to test your audio before or after joining a meeting. You can also join a test meeting if you want to test your audio and familiarize yourself with meeting controls. Use one of the methods to join a meeting. Click Test speaker and microphone. The meeting will display a pop-up window to test your speakers. If you don't hear the ringtone, use the drop-down menu or click No to switch speakers until you hear the ringtone. Click Yes to continue to the microphone test. If you don't hear an audio replay, use the drop-down menu or click No to switch microphones until you hear the reply. Click Yes when you hear the replay. Click Join with Computer Audio to join the test meeting with the selected microphone and speakers. Follow the sections below to test your speaker or microphone. 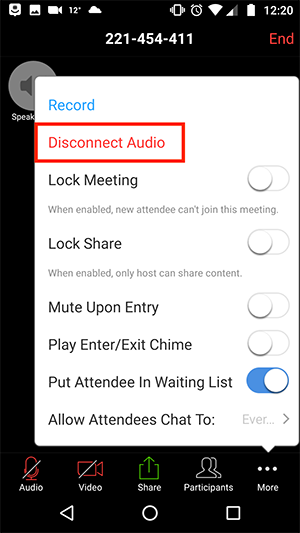 You can access your audio settings and test your audio when you are already in a meeting. In the meeting controls, click the arrow next to Mute/Unmute. Click Audio Options. This will open your audio settings. Click Test Speaker to play a test tone. If you cannot hear it, select a different speaker from the menu or adjust the Volume. Learn more about audio settings. In the Microphone section, you will see the green Input Level bar move when Zoom is picking up audio. 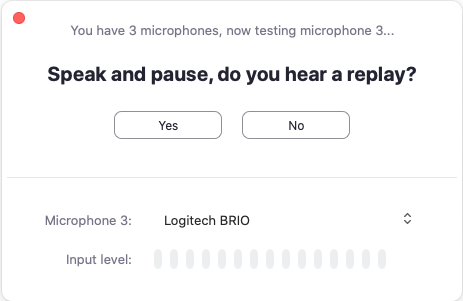 Click Test Mic to test your microphone. Your audio will start recording. Click Recording when you are done and it will play back. You can select another microphone from the menu or adjust the input level. Check Automatically adjust microphone settings if you want Zoom to adjust the input volume automatically. 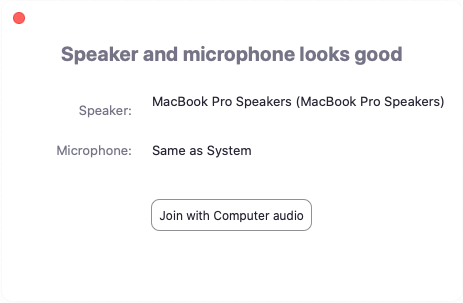 If you are on on Mac OS 10.14 Mojave or earlier and can't access the microphone, check your operating system permissions to confirm that Zoom has access to the microphone. See Using the Zoom Client and Zoom Rooms with Mac OS 10.14 Mojave for more information. If you are on Windows 10 and can't access the microphone, use the Windows search box to navigate to Microphone privacy settings. Switch on the Allow apps to access your microphone toggle, and enable access for Zoom. Click Settings. This will open your audio settings. Click Test speaker and microphone. This will open the audio settings. Click Test Speaker to play a sound. If you cannot hear it, select a different speaker from the menu or adjust the Output Volume. In the microphone section, you will see the blue Input Level bar move when Zoom is picking up audio. 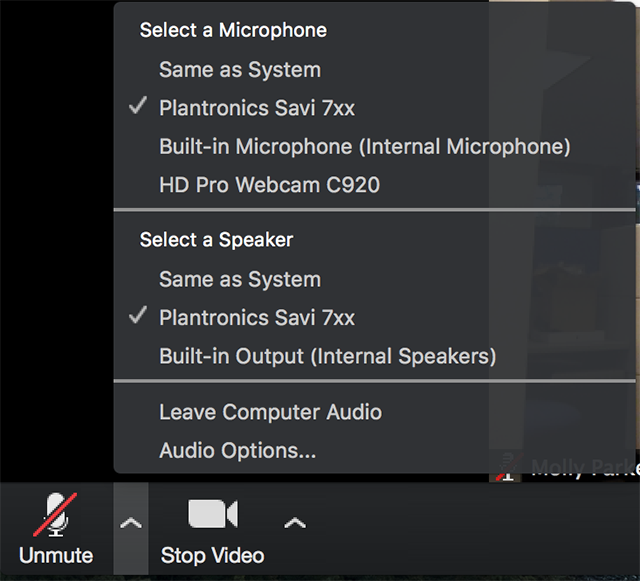 If Zoom is not picking up your microphone, you can select another microphone from the menu or adjust the input level. 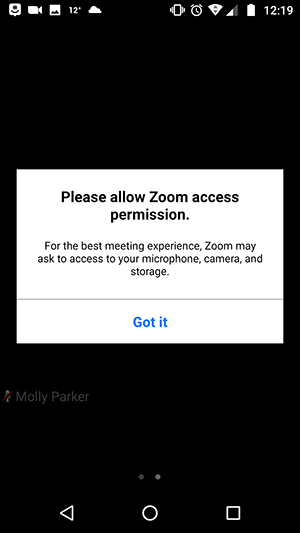 If this is the first Zoom meeting that you've joined, you will be asked to give access to your microphone. 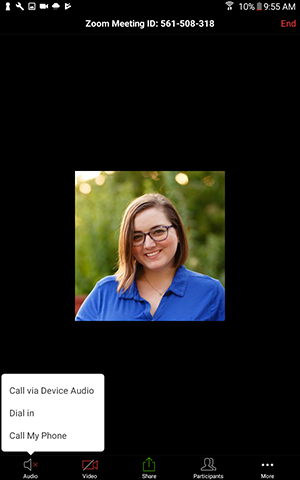 When you join the meeting, you will be prompted to join the audio. If you choose Cancel, you can open the prompt again by tapping Audio. Once connected, you will see the microphone icon to mute and unmute in the bottom left hand corner. If you need to join the audio with a different method, you can disconnect audio by tapping More and then Disconnect Audio. If you choose Cancel, you can open the prompt again by tapping Join Audio.